When it comes to machine shop services, working with a local Orlando machine shop has its advantages. Communicating with a prototypes to production manufacturing facility long distance creates challenges in language barriers, miscommunications, and availability. A quick visit to the local machine shop can often solve many potential problems. Here are some things to consider if you are shopping for an Orlando machine shop. Hiring a local Orlando machine shop affords you the opportunity to be directly involved in the prototypes to production manufacturing process. Understanding the process allows you to be actively involved in the design and production of your project. Getting a first-hand experience in the CNC machining, milling, turning and other machine shop services can give you peace of mind when tackling a complicated small part machining or close tolerance machining venture. 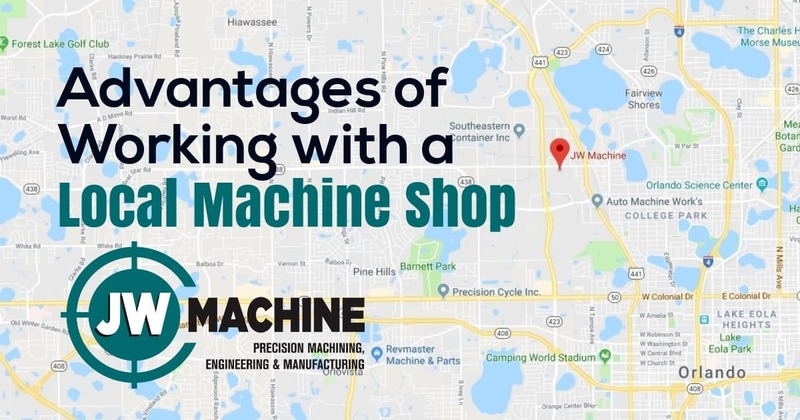 Driving across town to your local Orlando machine shop for a first look provides you the opportunity to see the design without shipping cost and delays. Using local CNC locations for your Orlando machine shop services makes it much more affordable to be actively involved in the prototypes to production manufacturing process. Remember, you get what you inspect not what you expect! JW machine is your Orlando machine shop connection for all your machine shop services. From CNC machining centers to laser cutting and laser etching, we are ready to provide top of the line machine shop services for your project. Call us today for a tour of our Orlando machine shop!